I sat against a large boulder in the direct afternoon sun. The wind was blowing hard out of the southeast and it was cool, but the sun was keeping me warm. I’d already moved around several times adjusting my position between shade and sun to deal with the dynamic weather. I was set up 200 yards above a large willow patch, hoping that a buck might show up out of the forest shadows. A sniffing sound from behind me caught my attention. I turned my head to look over my right shoulder and found a bear staring at me from ten feet to my right. It was not a large bear, no it was a small bear, yes a bear cub. There was nothing intimidating about the blond bear cub, but wait. Where was mom? I knew enough to be uncomfortable about having a bear cub standing ten feet from me. I kept my rifle in my hand as I stood up and moved over to my pack. If I could get my camera, I might get a good photo. Reaching the pack, I looked up and the cub was gone, but after finding my camera, a few squeals produced results. He was back. This blond bear cub was apparently without a mother bear. After the cub departed, I wondered why it would approach me, obviously smelling me as it came in from down wind. Then I remembered a hunk of salame was in my pack. This was one hungry bear cub. Since bear season had opened three days earlier, I concluded that possibly this bear was now an orphan and very hungry. For the final weekend of the “A” Zone, I made a final effort to spot a nice buck, but the best I saw was a medium-sized forked horn. Friday evening I found one small buck eating oak leaves and totally oblivious to my presence, but I don’t need venison at this time. The weather turned hot and I left camp in a t-shirt Saturday morning. Deer were feeding early, but before long they were out of sight. After seeing about a dozen deer and two bucks Saturday, I headed home for various commitments. Rob hunted Saturday eve and Sunday morning, with basically the same results as me. He found one buck that he considered shooting, as it had a nice horn on one side, but when it raised its head, the other side of the bucks antlers was very small. This may be the buck we named tri-pod last year, for his fork-spike antler configuration. Looks like it’s time to prep for duck hunting. With all the quail we have at the ranch, I believe we will be forced to hunt quail this fall, something that we don’t normally bother with. The quail population is quite impressive and with all the grass, they are out in huntable places more often. 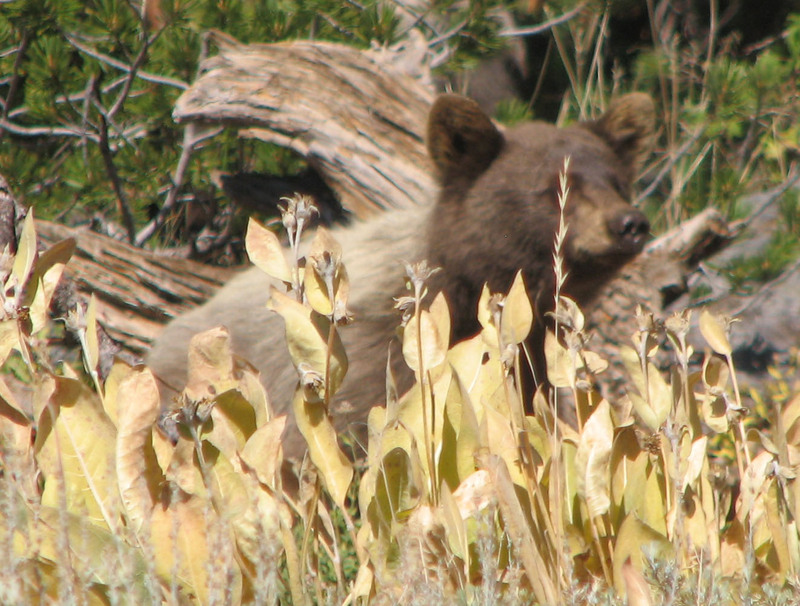 Nevada and California make game management decisions based upon Science. Recently, the California Fish and Game Commission approved limited sage grouse hunting based upon DFG surveys that showed the sage grouse populations stable or rising in the hunting zones where grouse hunting will take place. This decision shows the wisdom of the Department and Commission. Game management decisions based upon scientific knowledge produce a product that serves wildlife and the public interest. If game management were based upon emotion and politics, who knows where we would end up. Hunters agree that the sage grouse is a magnificent bird, but they also know its population is primarily based upon remaining habitat. Regulated hunting that takes into account population trends has no adverse effect upon grouse numbers. Nevada’s decision to hunt grouse shows that, just like California, they believe in making science-based decisions. We were there. On the ridge top at 9850 ft elevation, spotting scopes poised as the sun rose last Friday morning, one day before the D6 opener. The wind howled as it became light enough to catch the image of deer within 200 yards of us, then 500, then clear across the basin to the next ridge. Nothing. As the sun began to peak over the eastern horizon, it caught to tips of the peaks to the west and the curtain of light gradually worked it’s way into the basin. Surely a deer would appear before long. Saturday, opening day, was more windy yet. As we climbed to our lookout, a light shined down on us from the ridge above. A hunter was camped on the ridge at about 10,500 and he was shinning his light at us to let us know he was there. A few minutes after first light, we heard a couple shots from his location and we guessed that he’d downed a buck. However, no legal bucks did we see on Saturday, or Sunday. On Monday I spied the only legal buck of the trip, but he was so small that I could not shoot him. The small fork on one of his eight inch antlers made him a potential target. The fork was so small that I didn’t notice it until he stood in the sun sixty yards down hill from me. After centering him in my rifle scope, I pretended to take him and then watched as he disappeared in the williows. That’s the way it was. Fierce winds for three of the four days. I had good company and we ate well with excellent views. If I could figure out a way to leave today, I’d head back up there and be hunting tomorrow – I know there’s a buck up there somewhere. For many years running, the Holm family has donated a hunt to the Livermore-Pleasanton Chapter of MDF. And, for the second time, the Selna Family from Tracy has purchased the hunt and taken a “first” buck. 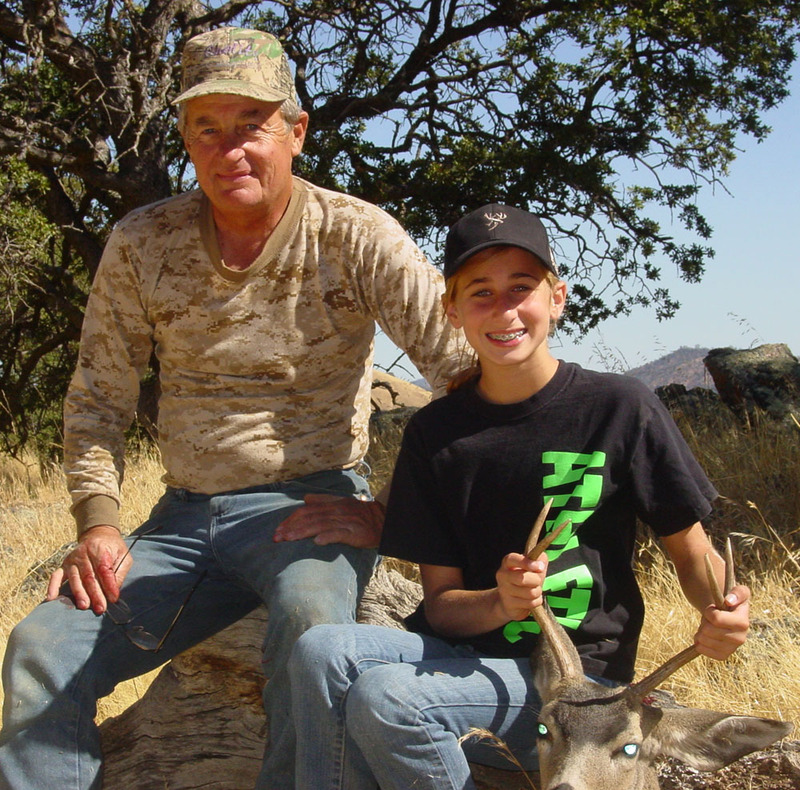 Here’s the story of Emilee’s first buck hunt as told by Bob Holm, who manages the Holm Ranch for his family. For those who missed the fun Sat. when the MDF Jr hunt took place, we were successful again!! Emilee, a 12 year old first time hunter, finally scored after several close encounters. About 3:00 P.M., after a good spot by my son, Bryan, we made our move on another buck. After an hour-long stock we closed the distance to 150 yards. Couldn’t possibly get closer as the grass we were belly crawling through wouldn’t cover a short rattlesnake. As Em maneuvered into the prone position for the shot, the wile buck began to sence something was rotten in Denmark!!! Even though the wind was in our favor apparently this animal was crafty enough to detect the six humans bearing down on him from above with ill intent. His burst for cover and safety, a mere 20 feet, was cut short by double lung heart shot by “one shot Em”!!! After much celebrating we moved into the less fun part of the hunt. Turns out our shooter was not a huge fan of deer blood, but somehow seemed to have blood all over her before we were done and headed for the ranch!!!!!! She got into the skinning and caping process with less fear of blood and was actually a help. This girl is a trooper! We side-hilled thru the wild oats in 95 degree weather for several miles with no whining and no quitting. We hunted from 6:30 to 4:30 with time out for lunch. 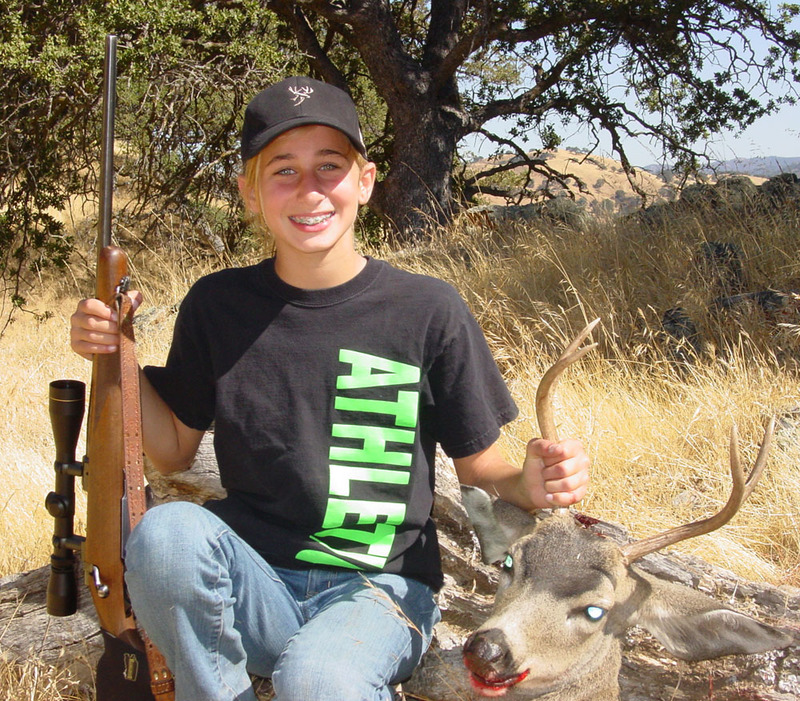 I’m afraid her dad is in for lots more hunts for her…. she has the bug!!! Emilee crawled within close range of her buck. Here are a couple more photos provided by Emilee’s father, Greg Selna. Greg Selna has been a consistant MDF supporter and volunteered at the Purple Heart Outdoors Event a couple weeks ago. Spent Friday night and Saturday morning at the ranch. It was hot and the deer didn’t seem very active, but I was distracted watching poachers and wondering if they were heading our way. Decided to make a brief still hunt and came upon a fairly fresh set of deer bones. 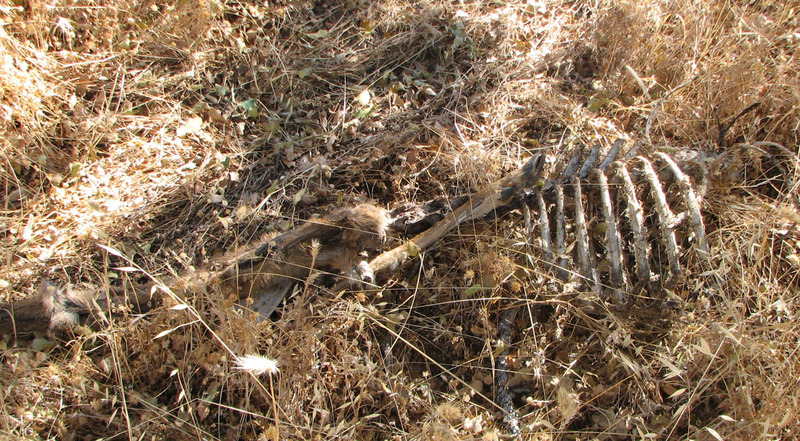 Another mountain lion kill. No deer photos on the trail camera. Wondering why. Got some good photos of juvenile red legged frogs. 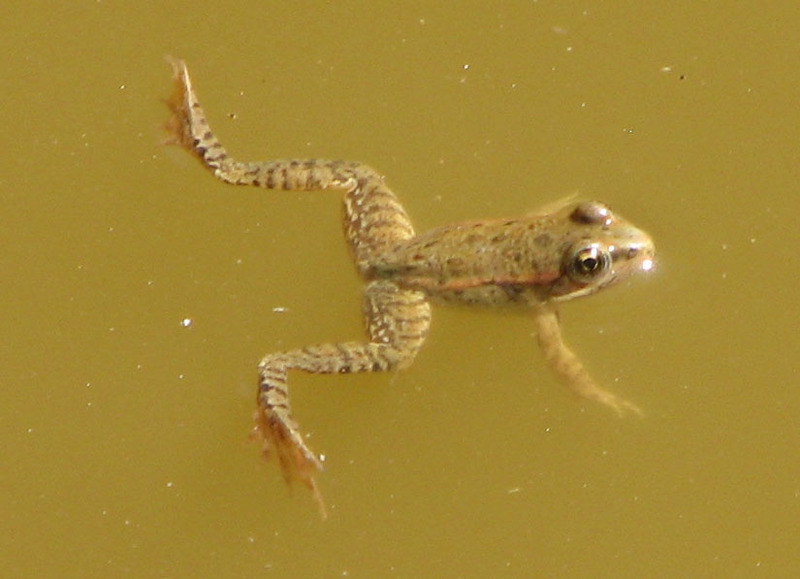 Juvenile red-leg frog in pond rebuilt last fall. Fired my .300 WSM and got it sighted in perfect for the upcoming D6 trip.